Anybody interested in greasing their songwriting wheels — and I do mean anybody — should get a copy of Songwriters Playground and explore the program it outlines. After several years of teaching songwriting seminars and workshops, Barbara has created one of the best tools I have ever seen for unblocking your musical and lyrical creativity. Bottom line? It’s a great book and a lot of fun. Click here to order the book now! There are many books about the business and craft of songwriting, but as you will discover, this is not one of them. 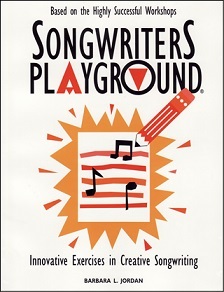 Songwriters Playground is a book you do, not just read. You won’t find in it any rules about writing better songs or tips about marketing them. What you will find is a series of provocative improvisatory exercises which will grab you by your creative lapels and propel you directly into songwriting. This book is designed to light your creative fires — and it will, if you let it! As a professional songwriter and music supervisor for films and television, I spend a lot of time writing and listening to songs. Many songs are well-crafted — they follow the rules — but only a few stand out. The memorable ones have a magic and vitality which the others lack. The question is: Where does this special quality come from? I can tell you with certainty that it doesn’t come from craft alone. Several years ago, while suffering from extended writer’s block, I worked hard at refining my craft. I read books, I took classes, I analyzed hit songs. And indeed, my craft improved — but at the expense of the magic. And writing songs was still a struggle. I finally broke out of my songwriting ruts not by learning more rules but by intentionally setting them aside. Through a variety of techniques designed to set the right mood, stretch the creative muscles and get me writing quickly without any concern for brilliance, I suddenly found myself writing more and better songs faster than ever before. As a consequence, I not only started to enjoy songwriting again, but I began to have consistent success in the music business with my songs. Their newfound freshness and vitality were obviously contagious. Since organizing the exercises in to the Songwriters Playground workshops, I have watched many of my students experience the same transformation. By turning their whole consciousness into a kind of creative pinball machine with an infinite variety of outcomes, participants rediscover the thrill of experimentation and spontaneity in their writing. The workshops liberate songwriters from their struggle to reconcile the demands of the marketplace with their need for unrestricted self-expression. People are freed to “just do it”. Chronic procrastinators start classes unable to begin writing , and by the end nothing can stop them! I haven’t yet found a way to bottle this elixir, but I am constantly asked for some kind of written guide to the Playground method. This book is the result. Like the workshops it has been a labor of much love. But because I am also a creative procrastinator, it is one which would not have been completed without the constant prodding and encouragement of my students. It is for them that I have made this attempt to anchor in book form the mercurial spirit of the workshop. I hope I have succeeded. When a student asked a famous novelist how to prepare to be a great writer, he replied, ‘Write!’ Easy to say, but if the hard part for you is jump-starting your creative motor and keeping it oiled, Songwriters Playground is a book you need to play with. After doing these exercises, you may never again have an excuse for being blocked or uninspired. This excellent book engages the songwriter in the sort of serious play that is the very soul of creativity. I highly recommend it! One of the most requested programs for songwriters ever presented at the National Academy of Songwriters. A brilliantly conceived, superbly organized funhouse of songwriter games and exercises designed to bypass the inner critic and tap into the power of the imagination. I love it! It’s playful, fun, and it encourages you to write from the heart. The reason we end up with writer’s block is that we take ourselves too seriously. This book encourages us to play, and that’s when we loosen up and do our most creative work. Now, who was it who said learning can’t be fun? Obviously it was someone who has never read this book. Whereas most books drag you through page after page of boring text, this one keeps you guessing at what crazy writing exercise, illustration, or quote you’ll find on the next page. If you’re looking for something really different to get those rusty writing gears working smoothly again, this may be just what you need. As a professional songwriter with thirty years of experience, I can’t say enough good things about this remarkable book. Far from being another dry “how-to” tome, “The Songwriter’s Playground” delves deeply into the art, craft, and sheer joy of songwriting. The prose style is deft and cuts straight to the point, making it perfect for aspiring as well as established writers. Ms. Jordan’s concept of the Song Dialogue (outlined in the third section) is alone worth the price of the book; the idea of developing your intuitive process to the point of allowing the song to ‘speak’ to you is nothing less than revolutionary. The author’s passion for writing shines through on every page. A true inspiration. Five starts are not enough!. As a songwriter and musical parenting expert, I ADORE this book! Fun exercises keep you moving and get you into a creative and playful groove. If you are looking for inspiration, pick a page and do the exercise. You will be laughing and creating in seconds. The exercises are also fabulous to play with your kids to get their creative juices flowing. Buy it! You will love it! Barbara Jordan has written a truly fabulous book that is choc full of wonderful tips and fascinating lessons. I was blessed some years ago to be in Miss Jordan’s first Writers Playground group in Los Angeles–an experience I will never forget. Songwriters Playground has evolved well beyond that now and the end result is a fantastic book revealing all the secrets of how one can reach the higher levels of creative expression. If you desire to be a serious songwriter then you MUST have a copy of this book in your songwriting tool kit…and refer to it constantly!